Sirhind-Fatehgarh is a city and a municipal council in Fatehgarh Sahib district in the Indian state of Punjab. According to the 2011 census Sirhind-Fatehgarh had a population of 60852. Males constitute 54% of the population and females 46%. Sirhind-Fatehgarh has an average literacy rate of 80%, higher than the national average of 74%: male literacy is 84%, and female literacy is 76%. In Sirhind-Fatehgarh, 12% of the population is under 6 years of age. According to popular notion, the present name of the city, Sirhind, comes from 'Sar-i hind', meaning the Frontier of Hind, as Mughal invaders saw it as the 'gateway to Hindustan'. However, a 5th-century AD tribe 'Sairindhas Aryans, which inhabited this area, might have also led to its present name. Varahamihira (505 – 587) in his Sanskrit treatise, Brihat Samhita, mentions the city as 'Satudar Desh', later it was inhabited by a tribe of 'Sairindhas Aryans, leading to its present name. According to Huan Tsang, the Chinese traveller who visited India during the seventh century, Sirhind was the capital of the district of Shitotulo, or Shatadru (the present day River Sutlej). In 12th century, Sirhind came under the rule of the Hindu Chauhan Rajputs of Delhi. During the rule of Prithvi Raj Chauhan (1168–1192), the Hindu Rajput ruler of Delhi, it became his military outpost. It further rose in glory during the Mughal Empire, when it became its provincial capital, controlling the Lahore-Delhi Highway, the Grand Trunk Road. During the Mughal era, Sirhind was the name for Malwa, since it was the area's capital city. Sirhind was the headquarters of the Mughal administration in Eastern Punjab. Many European travellers describe its splendours, and it also developed into a center of cultural activity. Sirhind was known for the dozens of saints, scholars, poets, historians, calligraphers and scribes who lived there. This city is mostly famous to Muslims for Great saint Imām-e-Rabbānī Shaykh Ahmad al-Farūqī al-Sirhindī (R.) (1564–1624). He was an Indian Islamic scholar of Arab origin, a Hanafi jurist, and a prominent member of the Naqshbandī Sufi order. A large number of buildings survive from this period, including the fort named 'Aam Khas Bagh'; it is said that in its heyday, the city had 360 mosques, gardens, tombs, caravansarais and wells. Younger sons of tenth Sikh guru Sri Guru Gobind Singh ji namely Baba Zorawar Singh ji and Baba Fateh singh ji were bricked alive at the age of 9 and 7 years rescpectively by then governor wazir khan. Gurudwara Sri Fatehgarh Sahib is established at that place to commemorate them. Baba Banda Singh Bahadur in 1710 destroyed the city of Sirhind completely and killed Wazir Khan the governor. The Sikhs occupied Sirhind and made Bhai Baj Singh the governor. By Air: The nearest International Airport from Fatehgarh Sahib is Chandigarh International Airport, roughly one hour drive from the district headquarters. It is well connected to the major cities like New Delhi, Bangalore, Jammu, Mumbai, Goa, Jaipur, Srinagar, Hyderabad and Leh via Indigo, Go Air, Air India, Air Asia India, Jet Airways, Spicejet and Vistara. By Train: The major Railway Stations in this District are located at Fatehgarh Sahib City and Sirhind town. 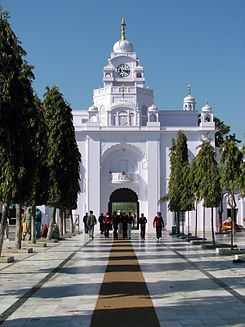 The Railway Station at Fatehgarh Sahib is located on Sirhind-Nangal Railway Line which is served by Northern Railways. The Sirhind Junction Railway Station is located on Delhi-Amritsar Section of Northern Railways. Many Regular as well as Super Fast Trains halt here. By Road:Fatehgarh Sahib is 43 km from Chandigarh, 53 km from Ambala, 62 km from Ludhiana, 148 km from Saharanpur, 161 km from Shimla, 204 km from Dehradun, 213 km from Haridwar, 271 km from New Delhi and is connected through Punjab State Road Transport Corporation (PSRTC) and some private travel services. Subhash Parihar, History and Architectural Remains of Sirhind, 2006, Aryan Books International. ISBN 81-7305-311-1. Subhash Parihar, "Medieval Sirhind and its Monuments", Marg (Mumbai), vol. 55, no. 4, June 2004, pp. 42–57. Subhash Parihar,"Historic Mosques of Sirhind". Islamic Studies, 43(3)(2004): 481-510. Subhash Parihar,"Arabic and Persian Inscriptions from Sirhind". Islamic Studies, 38(2)(1999): 255-74. ^ Memories of a town known as Sirhind The Sunday Tribune, 15 April 2007. ^ Sirhind Town(Sahrind) The Imperial Gazetteer of India, v. 23, p. 20. ^ Subhash Parihar. Sirhind : The Greatest Mughal City on Delhi-Lahore Highway. ISBN 81-7305-311-1.